The 2018 Mazda3 reviews are in–Edmunds.com gave this stylish sedan 4 out of 5 stars, citing the following: “sporty and confidence-inspiring performance,” “top crash test scores,” and “interior quality [that] exceeds expectations.” Explore our inventory of Mazda3 models below to see what Midlands Mazda has to offer West Columbia and Irmo drivers. You can also do more research on the competition by comparing the Honda Civic vs. Mazda3 and the Toyota Corolla vs. Mazda3. Jet Black 2019 Mazda Mazda3 Base w/Preferred Package FWD Automatic 2.5L 4-Cylinder 26/35 City/Highway MPG Midlands Mazda is proud to be your #1 source to buy Mazdas in Columbia, Lexington, Irmo, West Columbia, Lugoff, Camden, Sumter, Newberry, and Chapin South Carolina. Our Obsession is Your Satisfaction. Machine Gray 2019 Mazda Mazda3 Base Base AWD Automatic 2.5L 4-Cylinder Recent Arrival! 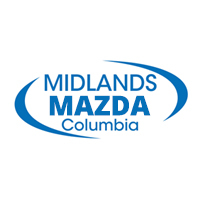 24/32 City/Highway MPG Midlands Mazda is proud to be your #1 source to buy Mazdas in Columbia, Lexington, Irmo, West Columbia, Lugoff, Camden, Sumter, Newberry, and Chapin South Carolina. Our Obsession is Your Satisfaction. Experience the Mazda3 interior and technology in person and choose from all the Mazda3 trim levels to find your perfect match at Midlands Mazda near Lexington. Don’t forget to check out our Mazda3 lease deals!